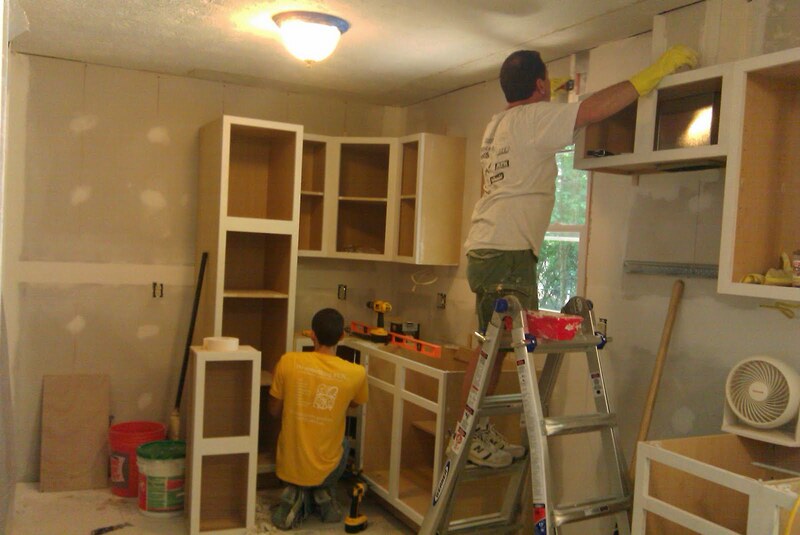 It's Not Rocket Science: Kitchen progress! Lots of progress! Whew, this past weekend was intense! Chris' dad is back in town, which means non-stop getting-stuff-done. We already had most of the cabinets in, but not the sink one. That was important because he was going to help do the plumbing in the kitchen. 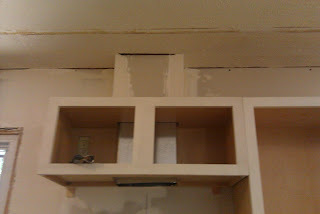 They needed to cut through the subfloor and the bottom of the cabinet to put in the pipes, so the cabinet had to be in place. So, we measured it out, and Chris and his dad went into the crawl space and installed a new PVC drain pipe, and Monday the copper water lines were going in. Meanwhile, I primed the ceiling. It's literally a pain in the neck, and I'm glad that Chris did the actual painting this week. The vent is all finished, and has a drywall box over it now that we'll paint to match the wall so it sort of blends in. It's still an eyesore, but it can't be helped. Chris has told me that the rest of the cabinets are now in place, and he's taken measurements for the countertop and ordered that. We ended up going for the shiny one that looks like polished granite, even though there was a slightly cheaper version available. It just had a matte finish, and would have been obviously laminate, whereas the one we stuck with will have a nicer look for only about $80 more. Also, in the overall scheme of countertops, it's still pretty cheap laminate. Those should be in in about 2 weeks. 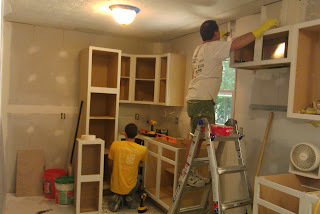 By that time, we should have the floor tiled (Mr. Wyatt is helping us do that tomorrow/Saturday), and the cabinets sanded and painted. I hope. I'm kind of in charge of that, so I need to get on it. In gardening news, the beans have started making beans, and the tomatoes and zucchini are growing strong. Yay! My sunflowers have sprouted, and I hope they survive longer this time. Finally, here are pics of the progress. Chris screwing together base cabinets, Mr. Wyatt drywalling up near the microwave vent. I'm not sure that the little skinny cabinet to Chris' left has been installed yet. It's supposed to go over the fridge. Guess I'll find out when I go up there this weekend. 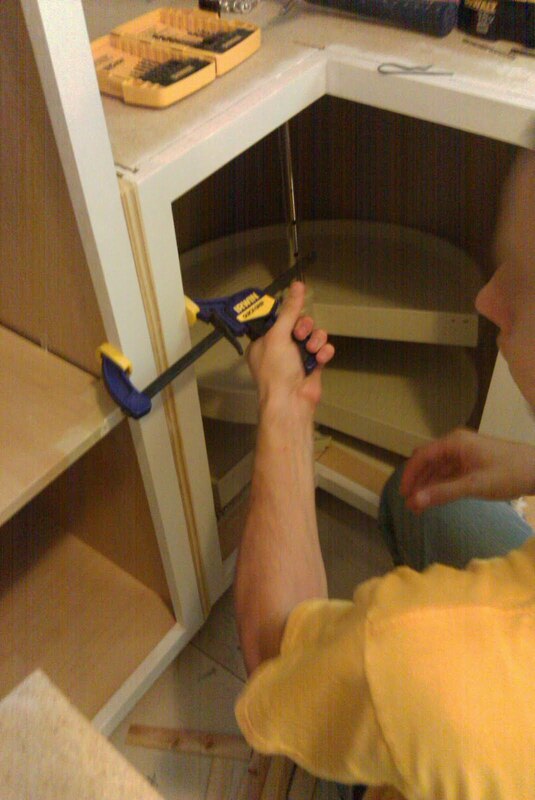 Here's a close-up of Chris filling a gap in the cabinets with some 1x material. The floor slopes slightly, so the bottom is mitered to make a smooth transition. It's not perfect, but we're crossing our fingers that nobody notices. Ugh, the vent box. At least people will be able to see that there is venting to the outside. I think it'll be a worthwhile feature. I hate microwave/vent combos that just blow air back at you. Also, above it you can see the reason why we needed to paint the ceiling. 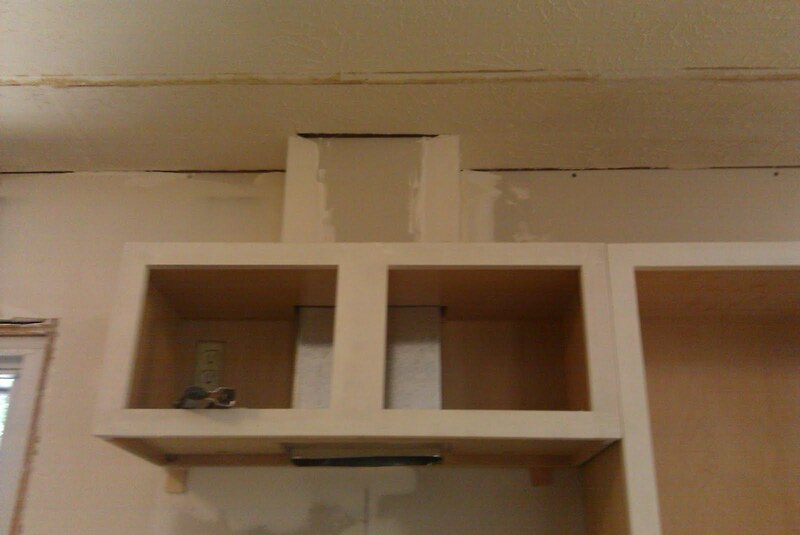 The old cabinets went all the way to the top, and were glued there or something. I hope the new paint covered it up!